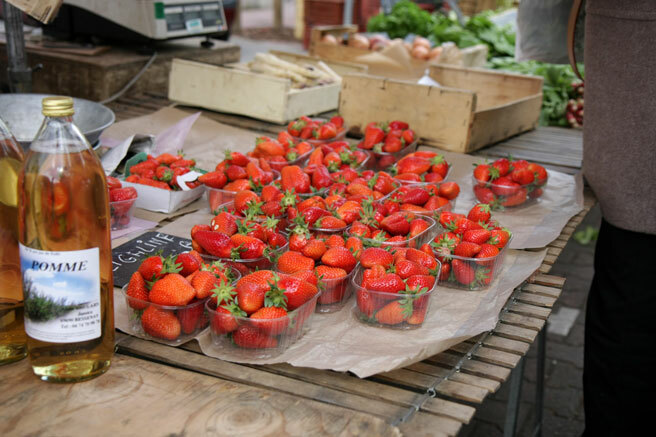 On Wednesday evenings starting at four o'clock and going until 7:30 PM, there's a market that sets up at Place Carnot, in front of the Perrache train station, quite special in two ways. 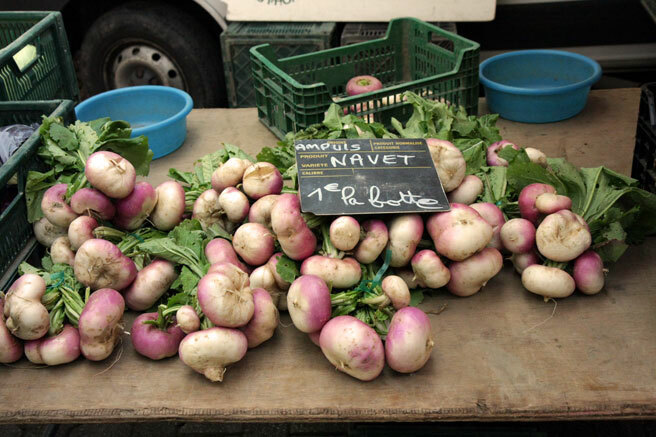 Being a night market where people can go after work gives it a special draw, and stands run strictly by producers makes the level of quality of the Marché Fermier at Place Carnot one of the best in town. The mean freshness quotient of the products offered at the Wednesday night market is far above any of the others, which makes it very hard to keep from buying more than you can carry. It's one of those markets where you can trust everything there and you want to buy a little of everything. 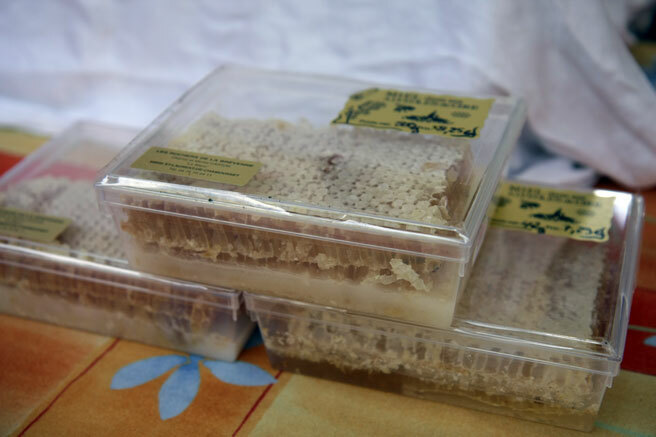 Local things are found cheaply that are only offered at much higher prices elsewhere. Even though the quality here is excellent and the prices low, it's like a little secret, discreetly setting up and taking down at the end of the day in the middle of the week, without fanfare or crowds. There are only a few stands, but the quality at each one makes this market definitely worth penciling in on your agenda. In fact, meeting friends and turning your errand into a pleasant apéro is a great idea, since the northern end of Place Carnot is surrounded by outdoor cafés with lots of seating, people to watch, and evening sun. 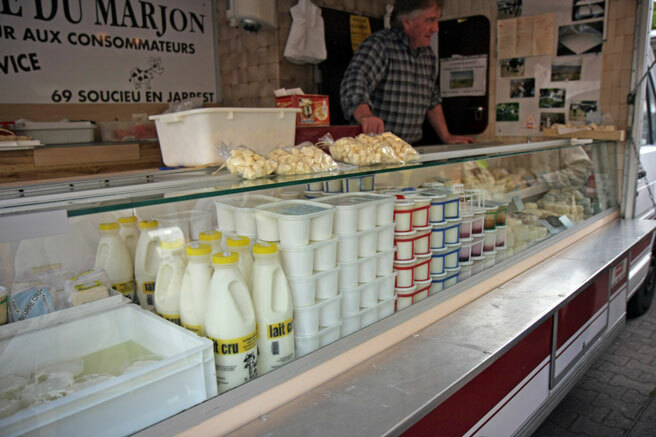 At the Marché Fermier, we very rarely ever hear anyone calling out to sell their wares. In fact it might be called a silent market. Every single stand is run by farmers, who don't have a habit of raising their voices. Their selling point is the terroir, and with this as your product, there is no song and dance necessary. We are content to listen to the evening birds singing in the trees above the square. If you speak French, you'll also be rewarded with a special kind of friendly chit chat from the farmers, who are proud of their product, know everything about it, and are happy to answer a hundred questions shot off at them city style in rat tat tat fashion. Ahem. In addition to ultra fresh produce, I come here for poultry, with not only an AOC Bresse Chicken producer on site, but also a steady supply of small flock farm raised birds - one taste of the soup from an old hen from one of the little stands that sells baked goods and preserves and you'll dream about the next time you can make it to this market. Some interesting charcuterie can be found here as well. Very much steeped in local tradition, there is a man who does a very nice couenne, a sausage made from ground pork skin, that you can spread along the bottom of a baking dish below any kind of bean or lentil before putting it in the oven, rendering wonderful flavor to a leguminous slow braise. 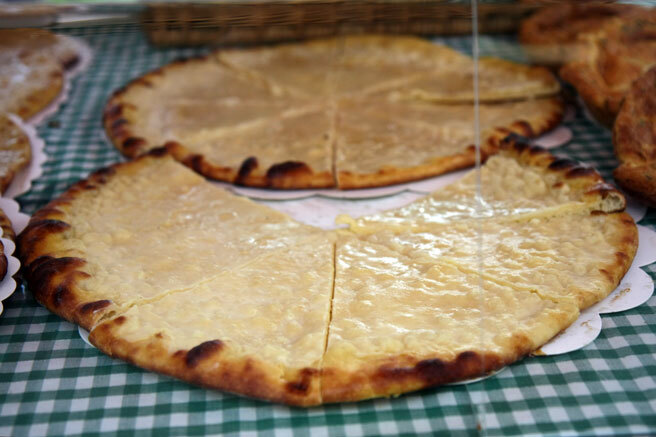 Bresse also hands us her delicious galette, a kind of thin sweet creamy cheese tart, a specialty to the region, and from south of the city we're offered a good selection of Coteaux des Lyonnais. 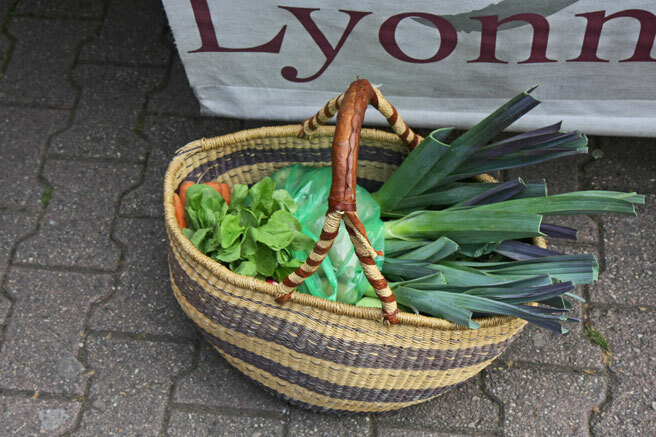 Lamb from the Bugey, cheese from Mont d'Or, and a steady supply of herbs and vegetables from all directions make this market a treasure trove. Oh it's lovely. 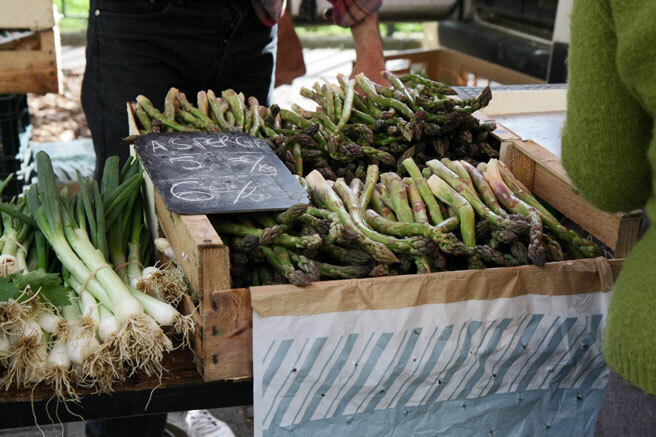 Our market won't start until late June, but local asparagus is available and I can't wait to try it. Such amazing photography. I almost think I am there. I think I could live in Lyon based on your photos and description! Why is it, in my several trips to France, I've never been to Lyon? Your photos and this market make that seem like a HUGE mistake! Dear ooishigal, jenny, nicole, and toni, thanks for coming by! Toni, it's never too late to plan a trip to Lyon! Sigh. I do miss living in Europe. I have the same shopping basket. Thanks for the memories. Gosh is there such a thing as a bad market over there? Cause so far all the ones you've generously shared photos of are beeeeeeautiful! There is a farmer's market near us but it's only set up on Saturdays in the morning, this makes it difficult for us to get there as our schedule is always shifting and out of whack. I have made a mental note to TRY TRY TRY and get to it as soon as I can so I can scope it out and perhaps get a small taste of a real farmer's market. I've heard of this market from friends who live nearby - it looks fabulous! How I wish I could taste those galettes. 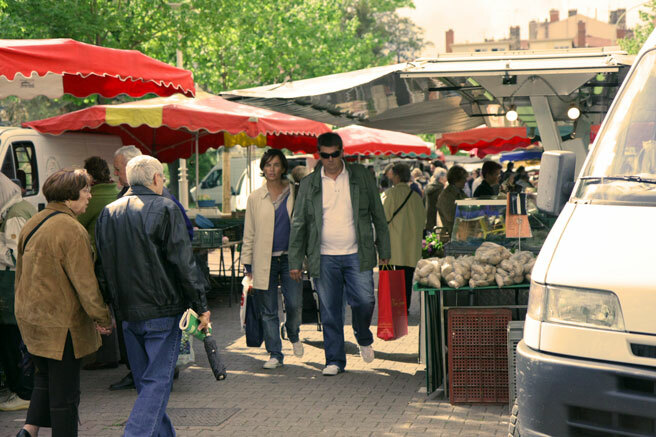 You are so fortunate to have such an array of markets to shop at! Your gorgeous photographs of the city makes me want to experience it myself. These market pictures are fabulous -- I love the way you get them to show up so wide on your blog. I'll have to ask my blog designer about that. Dear Robin Sue, Tace, Rosa, Loulou, and Betty, I appreciate your comments! I'm glad you like my photos. Betty, it doesn't take a blog designer to tweak your template! When I realized that most readers have upgraded from an 800 pix wide screen, I just had a go at the template. Have fun! Thanks for the advice Lucy. I do occasionally get into the html templates but since I don't really know what I'm doing, I do hesitate. I'll try to see if I can do this trick.